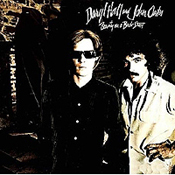 From their first hit in 1974 through their heyday in the '80s, Daryl Hall and John Oates' smooth, catchy take on Philly soul brought them enormous commercial success - including six number one singles and six platinum albums. Their songs were filled with strong hooks and melodies that adhered to soul traditions incorporating elements of new wave and hard rock. 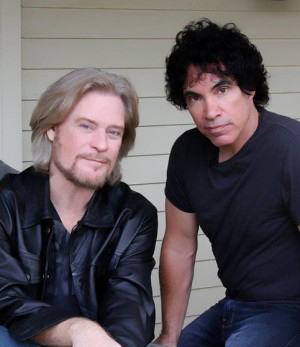 Daryl Hall began performing professionally while he was a student at Temple University. 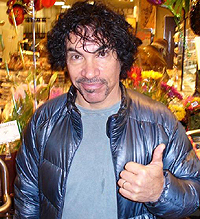 In 1967, Hall met John Oates, a fellow Temple University student. Oates was leading his own soul band at the time. The two students realized they had similar tastes and began performing together in an array of R&B and doo wop groups. By 1968, the duo had parted ways, as Oates transferred schools and Hall formed the soft rock band Gulliver. After Gulliver's breakup, Hall concentrated on session work whilst Oates returned to Philadelphia. In 1969 they came back together and began writing folk-oriented songs. Eventually they came to the attention of Tommy Mottola, who quickly became their manager, securing the duo a contract with Atlantic Records. On their first records - Whole Oats (1972), Abandoned Luncheonette (1973), War Babies (1974) - the duo were establishing their sound, working with producers like Arif Mardin and Todd Rundgren and removing much of their folk influences. At the beginning of 1974, the duo relocated from Philadelphia to New York. After they moved to RCA in 1975, the duo landed on its successful mixture of soul, pop, and rock, scoring a Top Ten single with 'Sara Smile.' The success of 'Sara Smile' prompted the re-release of 'She's Gone,' which rocketed into the Top Ten as well. Released in the summer of 1976, Bigger than the Both of Us was only moderately successful upon its release, but the album took off in early 1977 when 'Rich Girl' became the duo's first number one single. Over the following 27 years the duo kept busy creating such albums as X-Static (1979 - 'Wait For Me'), Voices (1980 - 'Kiss On My List,' 'You Make My Dreams'), Private Eyes (1981 - 'I Can't Go For That (No Can Do)'), H20 (1982 - 'Maneater,' 'One On One'), Rock 'N' Soul: Part One (1983 - 'Say It Isn't So,' 'Adult Education'), Big Bam Boom (1984 - 'Out of Touch'), Ooh Yeah! (1988 - 'Everything Your Heart Desires'), Change of Season (1990 - 'So Close'), Marigold Sky (1997 - 'Sky is Falling'), Do It For Love (2002), 'Our Kind Of Soul' (2004), and Home for Christmas (2006). 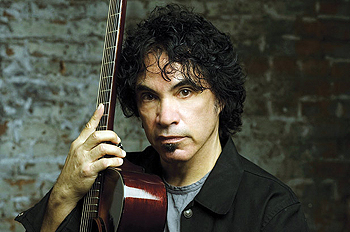 And now, with a brand new 4-disc box-set out in late 2009 (Do What You Want, Be What You Are: The Music of Daryl Hall and John Oates) and with John Oates having just-released a brand new solo CD, entitled Mississippi Mile, Exclusive Magazine recently sat down with guitarist/singer John Oates for a chat. Knowing he was born in New York City, but raised in Philadelphia’s suburb of North Wales, Pennsylvania, I first asked him what his upbringing had been like? "Middle-class kid living in small town Pennsylvania. Sports, music." Did you ever get into any trouble? "No, I wasn't too bad, actually. I always kept my nose clean. I always had too much going on to get into trouble." If I said these five words to you, what first comes to mind - Here Comes Peter Cottontail?! "Up and down the bunny trail!" OK, I was actually thinking of something more personal to you from your youth! "I'm a lyricist. Of course I'm gonna add the second line," he laughs. "What did you expect?" I was thinking more personal, something from your youth that your mother encouraged you to do! "Ahh yes, now I see where you're going with it. I sang Here Comes Peter Cottontail in a little recording booth at Coney Island, New York where it would actually cut a record. Etch a plastic disc that would pop out of a little slot. And I still have it. I've also got another one I did about four or five years after that of me singing 'Don't Be Cruel'." You actually recorded your first single, ‘I Need Your Love’ with The Masters in the year of my birth, 1966! How did that come about? "We recorded it on our own, it was my High School band. We pooled our money together from our gigs. We wanted to make a record so we went to Philadelphia. We got this guy called Bobby Martin who was a string arranger who later went on to be very famous with Gamble & Huff. He helped us and we cut it at a little place called Virtue Sound on Broad Street." "Now Frank Virtue [1922-1987], who owned that studio was famous for the Guitar Boogie Shuffle by The Virtues - an early instrumental guitar record. It was a very primitive analog recording studio. And then a guy from the Record Museum in Philadelphia - a place that sold collectors 45s and obscure 45s - they had a label and they also had put out 'Expressway to Your Heart' by the Soul Survivors." "So, the record I made, 'I Need Your Love' was only the second record on Crimson Records - and that was the end of that! Soul Survivors got them started and I put them away for good!" You were then signed to Atlantic Records in 1972 and have since recorded 21 albums to date (best of and greatest hits CDs aside!) So, all these years later, which is still the one H&O album you could sit down with and listen to straight through? "That's a very tough question. Can I pick three?" Absolutely! "OK, Abandoned Luncheonette, Along the Red Ledge, and Voices." And why those three? "Abandoned Luncheonette is just a moment in time when everything was perfect. Everything was like a confluence of the perfect storm of musical creativity. A great producer in Arif Mardin, a legendary studio in Atlantic Records, the best studio musicians in New York - Bernard Purdie [Drums], Gordon Edwards [Bass], Richard Tee [Piano], Chris Bond who had just started working with us and who was a genius guitar player - Daryl and I writing great songs, all coming together in this one perfect place." "Along the Red Ledge was very adventurous. It was a record from a period of time directly inbetween our '70s hits like 'Rich Girl' and 'Sara Smile' and before the '80s hits. It was this very fertile period for us and I think Along The Red Ledge led us to the '80s. And even though it wasn't commercially successful we had people like George Harrison, Todd Rundgren, Rick Nielsen playing on that record." Why do you think it wasn't as successful as your prior albums? "We had written some very unusual songs, everything was very musical. It was pure musicality because we had no gut consideration for hits or anything like that. I just think it was a very interesting record, a very under the radar record." And Voices because it was the first record we produced ourselves. And that set the template, the tone for us moving into the '80s. That really began the string of hits and the huge commercial success. Because we took over our own creative production." Legend has it that even before you signed for Atlantic Daryl named your ‘partnership’ Whole Oats - which resulted in the debut album being called just that! True or false? "No, not really. It came from a mail box. We shared an apartment in Philadelphia when we were scrounging around and it said HALL OATES. And so, as a joke it sounded like 'Whole Oats.' And so on the mail box, that's what it was!" "And we really didn't set out to call ourselves Whole Oats, but people started to think that. It was kind of an odd thing. So we dropped that quite quickly and became Daryl Hall & John Oates." What are your memories of making these 3 albums? H2O - "Skin, New York ... a guy called Mick [Haggerty] designed that album cover. He envisioned it and designed it. Actually, it was one of the few times we let someone else do an album cover for us. He created that whole thing. He knew exactly what he wanted to do. He hired Hiro, who was the photographer. A very famous New York fashion photographer. Mick put it all together. He was the same guy who directed the video to 'Family Man.' A very creative guy." Ooh Yeah! - "That was an in-between album. We had dropped out of sight after the mid-'80s and we took some time off. We then regrouped, came back to do that album, but I don't think either of us were really ready to. We were still in shock from the '80s and so we weren't ready to do a new album - but we did it. It was just one of those things we did for the new label." "We had pre-signed to Arista Records, but we didn't want to make any more records at that time! But they were begging for a record, telling us we owed them a new record over and over. So, we made a record. It was interesting and it was pretty good." Beauty On A Back Street - "It's my least favorite album that we've ever made!" Musically or just the cover art? "Everything. The cover - I don't care about the cover. It was a very dark time for Daryl and I personally. We were very unhappy with what we were doing creatively and so to me, that album is a representation of that. We were recording in LA, it was our third album recorded in LA - our first two were good experiences. But by the time we were getting ready to do the third one we didn't want to be there any more." "We were working with a guy we didn't want to work with, he was not well, the songs are dark, moody and very weird. There was just no connection to that album." Will we ever see a brand new, all original H&O album sometime soon, perhaps? "Not in the near future, no. Daryl and I are focused on our solo projects." Which leads us directly to your brand new solo CD, Mississippi Mile. Is it true that this album was a year in the making? "It was four days in the making and a year to release it!" Wow, so what caused such a long delay? "I recorded the album literally in four days. Cut 16 tracks and came up with the 12 best. Then I was wondering what I was going to do with it. Then through a very unique circumstance I met a guy [John Esposito] who had just become the President of Warner Bros. Nashville, although we had gone back in the music business into the '70s. And he was a big fan." "We met in Nashville, where I had recorded, and he asked me what I was up to. I told him I was making a new album. He asked me what I was going to do with it and I told him I was going to sell it out the back of my car like I'd done the other two," he laughs. "And I was not being that facetious about it. He said he'd like to hear it and so I invited him over to the studio. Which just happened to be half a block away from his office. He came over at lunch time and, of course, I had an amazing band in the studio at that time. I had Jerry Douglas, Sam Bush, Mike Henderson - an absolute steller band." "I put him in a booth, put some headphones on him, and we cut a few tracks. Afterwards he said he loved the music and wanted to help me put it out. And that's how it started. And from there we crafted a deal that was mutually agreeable for the label and me. It's the first time that I've actually been associated with a label for 20 years. Since early 1990." "So now I have a personal relationship with him and it's been going great. They did a great job for me. It's still on my imprint so technically it's still an independant release, but distributed by Warner Bros. And now we have a relationship that I think will go on to other things, but he and I have become very close, good friends." With regard the interesting treatments of the two stand-out covers on Mississippi Mile, 'All Shook Up' and 'You Make My Dreams Come True,' were they both always going to be that different of versions? "The Elvis song, and the treatment of that song was what gave me the idea to record this album. I was sitting around in my studio playing the guitar, just playing this blues riff. And I liked the riff and all of a sudden I started singing 'All Shook Up.' Of course, the original was in a major key and this is in a minor key which makes it darker and different. The riff that it's based on gives it a whole other feel." "And then I thought wow, this is interesting. I can do a lot of other songs like this. Meaning I could reimagine a lot of them. And I've always wanted to do a lot of my favorite songs from when I was a kid. And so that began the process. And when I got more into the process I realized I could make a beautiful autobiography for myself. Everything that mattered to me before Hall & Oates." "Because nobody knows anything about me before Hall & Oates. 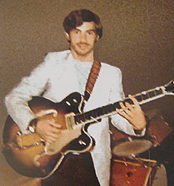 They assume that was my first band, my first musical venture, but that's not true. I was playing guitar by the time I was five. So there's twelve or thirteen years there of being a musician that's gone unchronicled. And so I decided that I was going to make a statement of what I liked to, as a kid, before I met Daryl, before we went in whatever deirection we went. This is the stuff that formed me as a musician. This is my true musical identity that then evolved from there. So, that's what I did," he laughs. 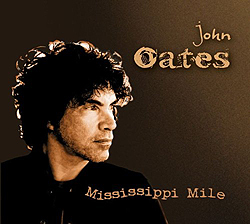 Mississippi Mile only has the 12 songs, yet 16 were recorded - can we expect to see them released at anytime, perhaps? "Well, technically 13, as I put a bonus track ['Please Don't Go'] on for the Japanese version. And the other three didn't come out that well. But the thirteenth will be released over here. I'm actually going to do a repackaged special edition high definition remaster with a live performance from B.B. Kings in New York. And I'm gonna put that out probably early next year, with that thirteenth track also included." Will the famous moustache ever come back?! "It came back about two years ago because I was made the Honorary Mastery of Ceremony's at the Stache Bash party presented by the American Mustache Institute," he laughs. "So, I figured if I showed up without one I'd be stoned to death! And that was in St. Louis and I performed as well. So I grew it back for that, shaved it off the next day, and now it'll never come back." 'The Show Pony & The Ground' is how you recently termed your relationship with Daryl within Hall & Oates. I think that is great! "Yes, that's very interesting," John confesses, notably searching his memory banks for when he might have said such a thing. 'I've also said it was The Sunset & The Horizon, which is very Zen. But The Show Pony & The Ground has got a little more organic-ness to it." Your box-set is entitled Do What You Want, Be Who You Are - so, after H&O is done, and there is no more recording, touring, etc. what is it YOU want to do, and who do YOU want to be? "That's a good question. I would hope to be able to mentor. I feel it's a responsibility to share my experience and my wisdom; or my lack thereof with people who perhaps I might be able to help. Simple as that. Whether it be on a business level or a creative level or simply a human level." Finally, and throwing you a journalistic curve ball, Exclusive Magazine love penguins, do you?! "I think they're very nice, yes," he graciously smiles. Would you have one as a pet, if offered?! "Yes, I would!" And what would you name him?! "Pete," he repies, without blinking an eye. "We had a nice penguin experience, actually. About two years ago we played SeaWorld in Orlando and my son was given a private tour of the penguin facility and we all went in and got to pet them!" A bit smelly though, aren't they?! "Yeah, a bit smelly ... a little fishy," he smiles, one last time. 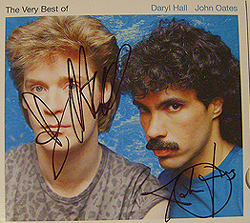 If you would like to win an AUTOGRAPHED copy of 'The Very Best Of Hall & Oates,' just answer this easy question: A well-known single from Voices, apart from four other hits, is the emotive ballad 'Everytime You Go Away.' But which British singer had a Billboard Number 1 hit with a cover of the very same song back in 1985? !